At the rear of Lincoln cathedral stands Queen Annes well. A small stone structure, with a pointed roof, the well has one wooden door, with six holes symmetrically placed across the front. Legend states, that if you walk around the well seven times, and then place your finger into one of the holes you will be judged by the devil. If you are a good person, you will feel the devil’s breath on your finger. If you’re bad, it will be bitten off! In 1349, the Black Death swept over Lincoln. The city’s population decreased rapidly as the bubonic plague took its toll on the city’s inhabitants. There was a shortage of space in the city to deal with the dead bodies-and the church couldn’t keep up with the amount of corpses that needed to be blessed and buried on consecrated church ground. As a result, the bodies were piled up and given a mass burial on grounds to the right of the cathedral, near the top of Greestone steps-opposite the cathedral doors which are nicknamed ‘the judgment porch’. It is said that once a year, on the anniversary of their burial, the ghosts of those buried in the grave rise from the ground and march in precession to the judgment gate, singing for the salvation of their souls, as they attempt to end the struggle of being stuck between heaven and hell. The doors they gather at depict heaven and hell, and are overseen by the Virgin Mary and Jesus-who allow access to the cathedral to those who are worthy of it. 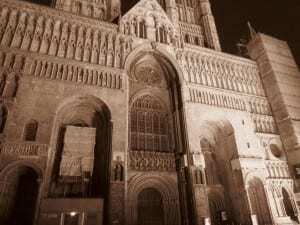 I visited Lincoln Cathedral both at night and in the day time. Obviously access to certain areas at night was very restricted, however in the day; entry to most areas is permitted. The contrast between the two times reflected heavily on my experience whilst there. In the daytime, the Cathedral had a very welcoming feel, and there was never any feeling that the building could have been haunted or had any ghostly goings on. This could have been for multiple reasons. Maybe it was because of the amount of people milling around the cathedral, or for the fact that it was flooded in sun light. However, I returned that same night, and although I could only walk around the grounds of the cathedral, the atmosphere was very different. The dark seemed to give the Cathedral an eerie feel, and the shadows that its external lighting created seemed very creepy. 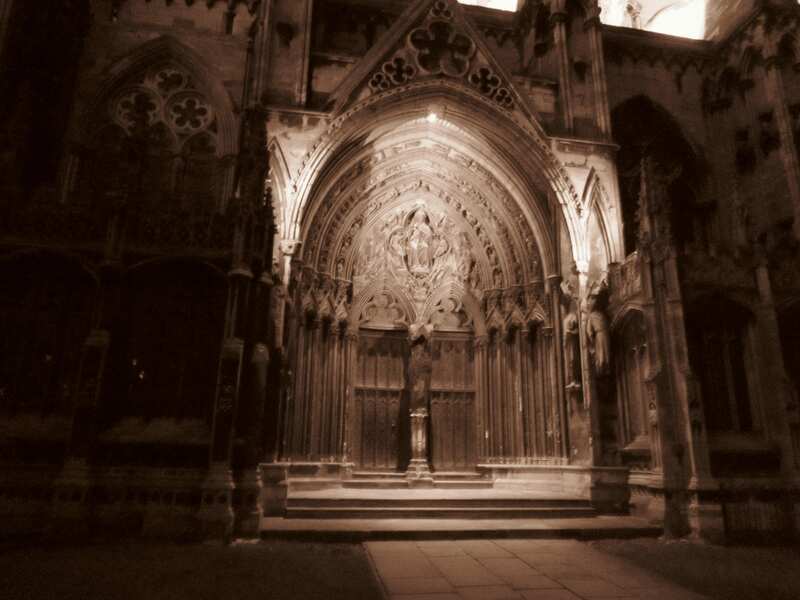 After walking from the main entrance to the side, past the ‘Judgment Porch’, and looking round to the small graveyard opposite, I felt a cold chill and a strong breeze that I hadn’t noticed whilst walking round the side of the Cathedral. From the side to the back, I noticed Queen Anne’s well standing in the grounds adjacent to the Cathedral. Walking around it seven times, I placed my finger inside one of the holes on the door, and have to report that I didn’t lose my finger, or feel the devils breathe on it at any point. Visible from up to 20 miles away, Lincoln Cathedral stands opposite Lincoln Castle. Once believed to be the tallest building in the world, Lincoln Cathedral is still one of the UK’s most impressive buildings- and is the third largest Cathedral in England. The first Cathedral in Lincoln was built in 1092, by order of William the Conqueror. The building project was overseen by Bishop Remigius, the first Bishop of Lincoln. However, a fire in 1141 inflicted severe damage to the roof of the Cathedral, and it came to Alexander ‘the magnificent’, who was then Bishop of Lincoln, to rebuild it. Having travelled far and wide, Alexander knew the most modern architecture available, and he gained a lot of praise for the painstaking detail he ensured the new Cathedral featured. 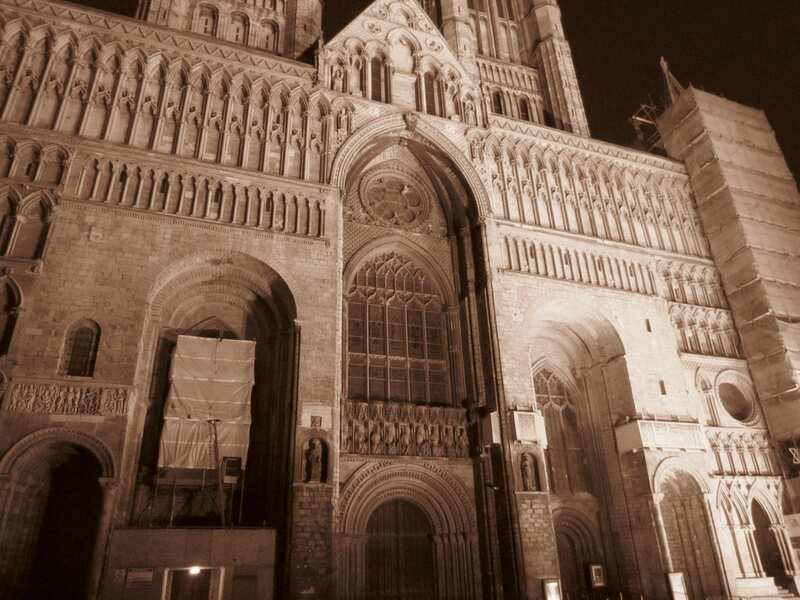 An earthquake shook Lincoln in 1185 and the cathedral took heavy structural damage. St Hugh, who was bishop at the time, organized the reconstruction in a gothic style. Flying buttresses were used to create greater roof expanses. Pointed arches rather than rounded ones and ribbed vaults allowed for larger stained glass windows to be erected. St Hugh was described as a caring man. It was his care for the common man, and his willingness to stand up to bullying kings that made him popular amongst the people of Lincoln. It was in 1220 that he was declared a Saint, and his statue still stands on the northwest turret. Famously, Lincoln Cathedral was used as part of the set for the film The Da Vinci Code. The chapter house was made to look like Westminster Abbey, after the film crews were refused access to film there.